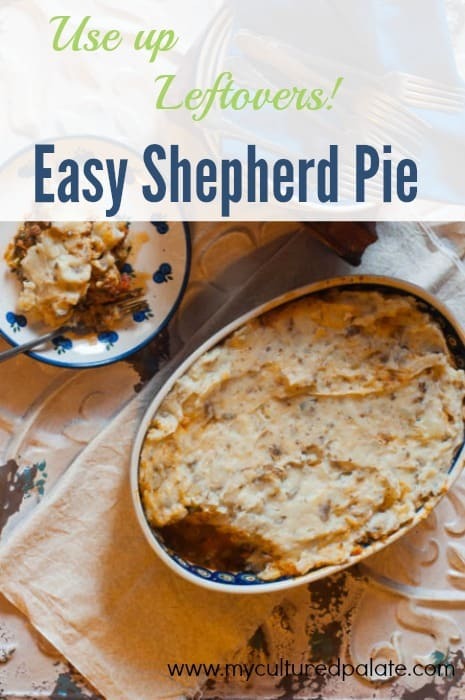 When we were first married, being the new bride and wanting to impress my husband with my culinary skills, I tried making a Shepherd’s Pie recipe from a vegetarian cookbook, Laurel’s Kitchen. It was a success – he was duly impressed! So, it was added to my arsenal of recipes. Recipes, for me anyway, are a work in progress – ever changing. This Easy Shepherd’s Pie Recipe is now quite a bit different from that original recipe. The major difference is the introduction of ground beef. Thanks to the GAPS diet, I am now able to eat meat – and, it is delicious. If, however, you are a vegetarian, simply leave out the ground beef and you will still have a delicious meal! In the following Easy Shepherd’s Pie Recipe, I mention using leftover mashed potatoes. This is a great way to use them up. But, I do not normally have leftover mashed potatoes anymore. Can you believe that our family can eat 10 lbs of potatoes cooked and mashed (with butter of course) and not have enough leftovers for the Easy Shepherd’s Pie Recipe? That is what happens when you have growing farm boys who eat. And eat. And eat! So, while this recipe is one that has continued to evolve, it remains a favorite in our home. It is hearty and comforting. After all, it has mashed potatoes in it! According to Wikipedia, another name for Shepherd’s Pie is Cottage Pie – it is a meat pie with a crust of mashed potatoes. Cottage Pie was used as early as 1791 when the potato was being introduced as an economical food crop for the poor. Originally, the pie dish was lined with mashed potatoes, as well as, topped with them. In 1877, the term Shepherd’s Pie was used signifying that the dish contained lamb – get it? Shepherds shepherd sheep! Anyway, just a bit of background for you – I find it interesting and hope you do too. Whether the “Shepherd’s Pie” is made with mutton or beef, the term is synonymous with Cottage Pie. But, I must confess, until I began reading, I had never heard of Cottage Pie – have you? Is yours made with beef, lamb or vegetarian? ***I buy all my spices from my affiliate partner, Starwest Botanicals, because of their superior quality. Their herbs & spices are organic, non-irradiated plus, I think they are more aromatic and full flavored than any others. Unless you have leftover mashed potatoes, cook the potatoes in boiling water until tender. Drain, mash well and add butter, milk and salt. Cut the broccoli into flowers and stems - slice stems in 1/4 inch round pieces. Add vegetables and the remaining ingredients to the ground beef mixture. Bring to a boil and cover. Turn the heat to low and simmer for about 15 minutes or until the vegetables are tender. Place the vegetable mixture in a greased 9" x 13" dish. Spread the mashed potatoes over the top - dot with butter. Bake at 350 F for about 15 minutes - until the potatoes are piping hot.